The Advanced Payment Methods Pro add-on will allow you to specify payment methods for certain events. For example, you could offer one payment option for one event and a different payment option for all other events. Need to Buy a Support License for Payment Methods Pro for Event Espresso 4? This add-on requires Event Espresso 4.9.32 or newer. It cannot be used with old versions of Event Espresso 4. It is not compatible with the Multiple Event Registration add-on. Download the current version of the Payment Methods Pro add-on for Event Espresso 4 from your Event Espresso account. You will not see any new WordPress administration menus for the add-on. Payment methods (payment gateways) are set up through the payment methods screen and then enabled through the event editor. Login to your WordPress dashboard (WP-admin). Then go to Event Espresso –> Payment Methods. Look for the payment method that you would like to limit to one or more events and click on the name of the payment method. If this is a new payment method that you are setting up for the first time, then click on the button to Activate the Payment Method. This will expand the settings for this payment method. Go ahead and setup the payment method by entering any credentials (if applicable). You can then jump to the section below for Usable From. You can set up additional payment gateway accounts to use for other events. First, you click on the button to Activate Another Payment Method which appears towards the top of the payment methods settings screen. Then you update the Admin-Only Name to something easily recognizable. For example, if you are wanting to setup PayPal for a specific event or a set of events, then you could update the name to PayPal Express – Project ABC. Next, enter your credentials (if needed) for your extra payment method. Now scroll down and locate the Usable From option. The settings that you need will depend on how you want to use this extra payment method. If you would like to allow a payment method to be available for all events automatically, then place a checkmark for the setting for Front-end Registration Page and set Available By Default to Yes. Here is an example of the settings to enable for all events. If you would like to allow a payment method to be available for specific events, then place a checkmark for the setting for Front-end Registration Page and set Available By Default to No. Here is an example of those settings. 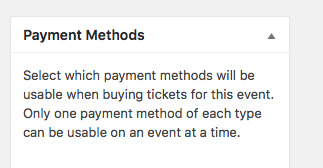 Next, you’ll want to enable this payment method for select events. Go to Event Espresso –> Events. Then click on an event that you would like to use this payment method on. You’ll now be viewing the event editor. Scroll down and look for the Payment Methods area which appears in the lower right area of the page. If you do not see it, then toggle Screen Options in the top right and then place a checkmark next to Payment Methods. From the Payment Methods area, select the payment methods that you would like to offer for this event. Here is an example of how the section will appear. You can then save changes to your event by clicking on the Update button in the event editor. Are you running a current version of Event Espresso 4? This add-on needs at least version 4.9.32 to activate. Can this add-on be used with the Multiple Event Registration add-on? The Payment Methods Pro add-on cannot be used with the Multiple Event Registration add-on as the Multiple Event Registration add-on allows a guest to add multiple events to a cart and then register at once. Where is the menu screen for this add-on? This plugin does not create any new menus in the WordPress admin screen. It uses the payment methods screen along with the event editor for Event Espresso.